Despite riding through the gravel after running off track at one point Marc Marquez led the way in morning Warm Up at Sepang, ahead of Jorge Lorenzo and teammate Dani Pedrosa. A 2’01.073s lap had Marquez (Repsol Honda) top of the session ahead of the race, which he will start from pole position - his 13th pole of the season. 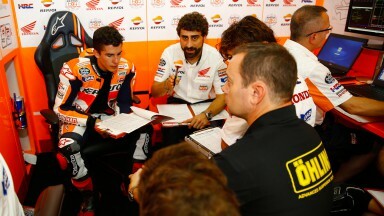 A margin of 0.258s separated Marquez from Lorenzo (Movistar Yamaha MotoGP) in second with Pedrosa (Repsol Honda) finishing third. 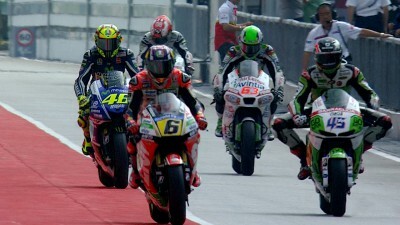 Both Valentino Rossi (Movistar Yamaha MotoGP) and Andrea Dovizioso (Ducati Team) were within half a second of the top time. Pol Espargaro (Monster Yamaha Tech 3) finished in 14th position, having been declared fit despite a broken metatarsal in his left foot. The Spanish rider will have pain killing injections before the race. Nicky Hayden (Drive M7 Aspar) suffered a crash but was unhurt.